This week is week 9 (of 10!) of the Quilt Sampler 2 class. All our blocks should be done and this week we will attach our mitred corner borders. Marilou had all her homework done and assembled her quilt top in the last class. Inspiring! This week, I’m sewing like crazy to catch up and finish up my last blocks. 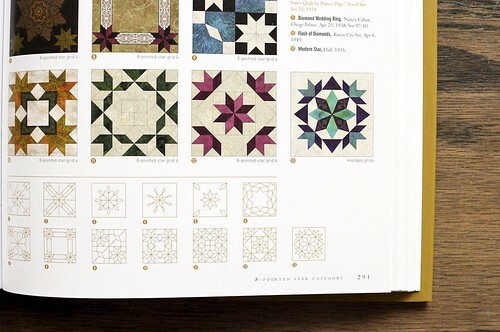 This particular block is special to my Quilt Sampler. 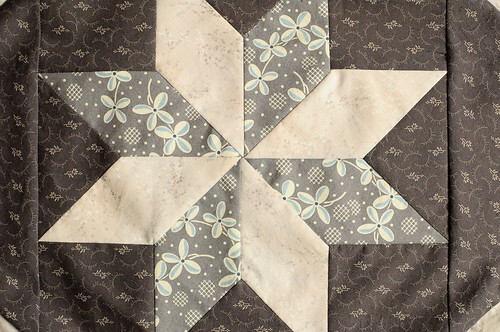 It was meant to be a Carolina Lily block. As I was sewing up my lilies, I kept seeing half a star. 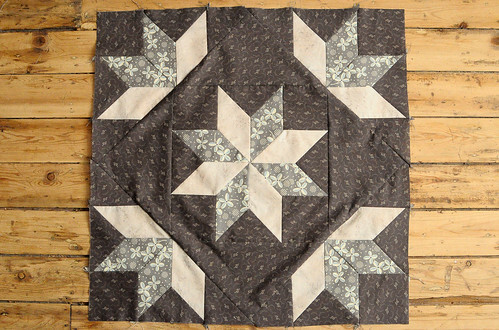 I looked through the Quilter’s Album of Patchwork Patterns and in the section on eight pointed stars found the Flash of Diamonds. The components for this block were so similar that I couldn’t resist trying it out. Star blocks are my absolute favourite! Sewing y-seams is a bit tricky, but there’s something about it that I really love. The more y-seams I sewed, the better I got. The other key thing that I’ve learned from making this sampler quilt is the importance of careful finger pressing and not overusing the iron. It is so easy to stretch out bias cuts on your fabric which results in wonky blocks. 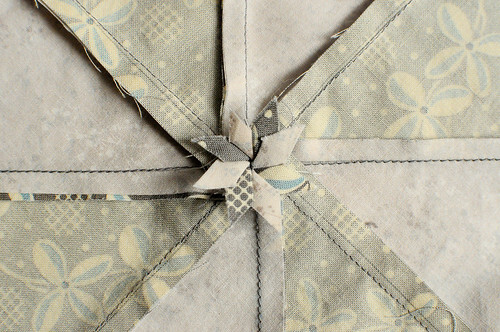 When I sewed together the middle star, it came together perfectly. If you look at the centre, all the points meet precisely and not are cut off! My favourite thing about this block is actually the back of it. When you look at the back side of this block, you will see that all the intersections of seams fan out. It’s crazy how proud I am of something that will soon be on the inside of my quilt where no one can see it! oh my lord! Marylou is blazing ahead! It looks so good! I gotta shape up and make my filler blocks & sew sew sew! so pretty!!!!! i love the fanned out part at the back so much as well! You’re a super star, Karyn! I love it! Karyn, I think that if anyone could make the back of something look as great as the front, it would be you!! I love it! I looks amazing! So pretty! So beautiful Karyn…i can’t believe how perfect it is…you are the master.